Winter is slowly creeping it's way in. Much of the northern hemisphere is experiencing increasing darkness as the days grow shorter and colder. This New Moon ushers in the Cold Moon Cycle, signifying a time of both hibernation and rebirth. A New Moon always represents rebirth and the beginning of a new cycle, but this New Moon in particular holds potent energy for a powerful transformation. Your soul may be calling you to go through deep waters to access this rebirth, but walking through the Winter of your soul will be worth it. There are many lessons to be found within the cold.. the Winter season can provide a true testament to the strength of our soul. Let this Scorpio season take you deep within yourself to witness the powers of your transformation. Grab a cup of tea or cider & read on to see what this New Moon cycle has in store for you! Tonight's New Moon in Scorpio intensifies the already intense energy we may be feeling as we experience the change in seasons. Scorpio is a watery sign that evokes our intuition and intensifies our feelings. You may be feeling more vulnerable than normal during this Scorpio cycle. It's almost like our emotional volume knob gets turned up when the moon is in Scorpio, so a New Moon in Scorpio can provide for a very intense time! Your psychic awareness and intuition may be sharpened, and if you are an empath, be sure to cleanse yourself during this New Moon. Emotionally you may feel more sensitive than normal. Sensuality and sexuality may be on the forefront of your mind as well during this time. This New Moon offers a total rebirth on an emotional, physical and spiritual level. Take advantage of this fresh new energy that is available to you. Travel deep within your soul and find out what it is you need for this rebirth to happen. Don't be afraid to look within your darkness to understand yourself better during this coming Cold Moon Cycle. The Card Pulled for this phase is the Blue Moon card, with the message of Renewal; a perfect card to pull for such deep waters we are about to tread. The Blue Moon represents a rare opportunity for renewal and a fresh perspective and outlook coming your way. This New Moon truly is an important time for telling the universe what it is that you want. Renewal can come to us in many ways, so seek out your own way of finding renewal. Self care is important, and you will be better for it in the future. The First Quarter Moon takes place in Aquarius on the 26th of November. The First Quarter Cycle is represented by the fire element; as the moon grows in the sky, our own personal energy is ignited in many ways as well. This First Quarter Moon takes place in the dreamy sign of Aquarius. You may be feeling extra inspired during this time! Your visions and goals may soon be coming to fruition, and you may be on the verge of completing something big in your life. Maintain and hold your vision. Trust in yourself and the goals you have put into place and go after your dreams. Activate your goals by meditating and visualizing the outcome. Use your imagination to help you visualize the details to help you truly ignite your goals and intentions. The card pulled for this phase is the Guidance Card. The answers to your questions will be shown to you. It may be that you are on the brink of finishing something big right now.. if you are feeling unsure of yourself, try reaching out to those in your community or tribe for feedback and advice. There is guidance available to you at this time, either through the help of those that love you or within your own intuitive self. Access this guidance from within through visual mediation. Take advantage of the moon in Aquarius to access your pool of inner knowledge. The Full Moon takes place in Gemini on December 3rd. The moon in Gemini might have you feel outgoing and extroverted. You could be finding yourself more light hearted, cheerful and sociable than normal. The Full Moons represent fulfillment, celebration and the turning point of a cycle; after tonight, the moon will begin to wane back to New. This Full Moon in particular is also signaling the coming Winter season ahead for those of us on the Northern Hemisphere. What does this mean? This New Moon cycle is all about the winding down of the seasons, embracing our darkness and embarking on transformation... Find the comfort in the chaos and look for the peace in the unfolding. The Winter season is inevitable, (even if you don't experience literal snow where you live!) so you might as well learn to adapt in the best way possible! Do something to honor yourself and aid in your relaxation right now. Go into hibernation mode if you have to- whatever that might mean to you. Take a nice bath with a cup of coffee, binge watch your favorite show with a glass of wine, or stay in with a nice sketchbook or novel. You define your level of comfort. Seek out the experiences and rituals that offer you comfort even if the outside world is full of chaos. The card pulled for this phase is the Super Moon card. Be prepared for anything during this phase. The emotionally charged Full Moon is in the airy sign of Gemini and goes opposite the Sun in Sagittarius on the 3rd, while on the 1st, Venus entered Sagittarius.. igniting many aspects of communication within our relationships and how we express ourselves to others. 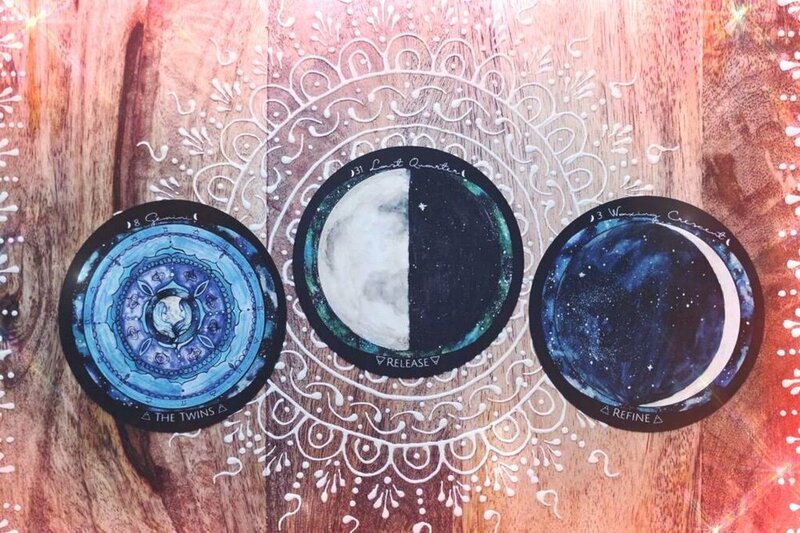 The Super Moon card indicates that a lot is going on... and anything is possible, so watch your emotions, be mindful of your habits, and choose your words wisely. Mercury also goes retrograde on the 3rd in the sign of Sagittarius! It's important to keep an open mind and go with the flow. Use the time in Scorpio to delve into your spiritual studies and practices. Tune yourself to the moon and truly listen to your intuition before acting. Remember that Mercury retrograde is not a bad thing! It is a normal occurrence that holds the opportunity to bring you closer to yourself and others. Your communication methods (and even technology) may be put to the test during this time, but it's nothing to worry about. Mercury Retrograde has a way of showing us what needs to be reworked for our lives to flow smoother in the future. Don't forget to check back on December 3rd for the Full Moon Ceremony honoring the Cold Moon! The Last Quarter Moon takes place in the sign of Virgo, the Healer. The Virgo energy, mixed with the Last Quarter Moon may have you feeling a bit on edge. There is going to be a lot of energy and it will need a place to go! On December 9th, Mars enters the intense sign of Scorpio and amps up the energy and powerful emotions even more. The Waning Moon may have you wanting to finish up goals or tie up loose ends which is important as that energy does need to go somewhere. Utilize this Virgo energy by looking for ways you can bring more organization into your life for the new year ahead. Virgo holds the ability to solve organizational problems in a creative way. So allow the Virgo within you to do it's job during the Waning/Last Quarter Cycle. You can organize areas of your home, donate to a thrift store, brainstorm new ideas for the upcoming year, etc. The card pulled for this phase is the Connect card. Remember that everything is connected! This Virgo energy may be calling you to clean your house and organize small aspects of your life, but understand that this is connected to larger areas of your life. Everything is connected! It's been said that the way we do one thing is the way we do everything.. try keeping your home organized and clean or working with a to-do list more consecutively and see what clarity it can bring to different areas in your life. This will also be important for the transition of Saturn into Capricorn on December 20th. This transit will bring our careers and our social status into focus. You may find yourself more driven towards self discipline. So use this time to help prepare yourself. Remember to prepare for the winter season ahead. Tonight is a powerful night, so be sure to set a solid intention. Don't forget to cleanse and charge your crystals and decks under the New Moon.While you are at it, cleanse your body and nourish your soul in any way you can..
Self care is important during this time! What are your favorite ways of taking care of your Self during the New Moon? Tell us in the comments! Sign up with your email address and name to receive news, updates, ceremonies, New Moon readings and more! Happy New Moon Solar Eclipse, Moon Tribe! We are shaking things up over here on the Moon Blog and we wanted to offer you something different this New Moon! The Solar Eclipse in Pisces expands your dreams and may gift you a vision of new possibilities and opportunities to expand creatively. It is up to you to follow your intuition through this new threshold and dive in. So that is what we did! Today we want to share more about Moon Signs and how to connect with them through this Seed Moon Cycle. So grab a cup of tea and sit for a spell and learn more about your Moon Sign! Most people know their Sun Sign, but the Moon Sign is just as equally as important. Just as the Sun was in a zodiac sign the day of your birth, the Moon was also traveling through a zodiac sign adding another layer to your cosmic makeup. The Moon travels quickly through all 12 zodiac signs every moon cycle, so in order to know which Moon Sign is yours, you need to know the exact time of your birth. You can find your birth time on your birth certificate, or hopefully one of your parents may know. Calculate Your Moon Sign here! The Moon filters the zodiac signs differently than the Sun. The Sun radiates light, so your Sun Sign is usually the sign that makes a big chunk of your personality and how you let others see you, or how you shine your light outwardly into the world. However, the Moon Sign reveals our inner world, and reflects to us how we perceive the world and relate to others. The Moon rules the emotions, so your Moon Sign will reveal how you control your emotions (or how your emotions control you) and what you need to feel safe to be your best self and shine. Your Moon Sign also reveals your subconscious motives, so if your Moon sign does not resonate with you, you may need to look deeper and confront your subconscious fears. Don't worry though, the Moon sign is not meant to be scary, but helps reveal deeper layers of our psyche, so we can learn more about ourselves and ture desires. Plus it's really fun to read about! Once you know your Moon Sign, now you can learn more about it and how you can work with the archetypal energy through the moon cycle! Read about your Moon Sign below! If you are an Aries Moon, you bring the fire and passion into everything you do. Your emotions boil and bubble over and that can be so refreshing, but also intense! It is important for the Aries Moon to channel their zealous energy into healthy hobbies and activities. Hotheadedness can be an issue if you let your emotions and energy scatter. You may be impulsive, but that is also a part of your charm. Just try not to offend someone in the process. To balance an Aries Moon, bring more calm and watery energies into your surroundings. Moon Charting: Track how much water you should be drinking to add more cooling soothing vibes. You can also track when you feel the most positive and vibrant, and when you feel your anger rise. Colors to use: Soothing blues and vibrant shades of red and orange. A Taurus Moon sign loves affection, adoration, and gives love with their whole heart and soul. Taurus Moon's shine and feel the most confident in a loving relationship. You are also very intuitively connected with your body and senses, so make sure you truly listen to your bodies needs! Taurean Moon signs are known to eat their emotions, especially when stressed, so when you feel you begin to over indulge that is the time to check in with the source of your emotions. Whether or not you are in a relationship, the best relationship you can love and nurture is the one with yourself! Moon Charting: Track how you nurture and love yourself through the moon cycle, adding pampering and beautify rituals will spark your inner Venus (Venus is the ruler of Taurus)! You can also track your other relationships, or when your heart chakra is most open or closed. Color suggestions: Reds and pinks for love and sensuality, and shades of green for your Heart chakra! As a Gemini Moon, you may feel pulled by all your emotions all at once. The duality of Gemini brings forth many voices and perspectives from within. You have a talent to articulate what you are feeling or what you think you "should" be feeling, but may forget to actually feel it! When you feel overwhelmed, remember to come back to your breath and breathe Gemini! Your natural element is air, so focusing on your breath will ground you back into your body and the present moment (allowing your emotions to move through you too). You may feel anxious most days, but it is usually because your mind is creating or replaying multiple scenarios simultaneously! Gemini Moons are a breath of fresh air, but don't burn yourself out. Moon Charting: Focus on staying in the present moment and observe your surroundings more. Track and see if you are a listener or talker or a balance of both. Create a daily grounding or calming meditation ritual, so you can stay present and in your body. Colors to use: Aqua blues and soothing purple tones bring calm and stillness. The Moon is the ruler of Cancer, so if you are a Cancer Moon, you are a true Moon Child! You are so connected to your emotions in every minute, you may already notice a pattern in the ebb and flow of your own emotions and energy. You may be quiet or shy, at least at first, but still waters run deep and once someone gains your trust you are completely devoted.You prefer small intimate parties and you love the comfort of your own home. Creating your sanctuary is so important for you to feel safe, supported, and to grow creatively. You need your sanctuary space to have time to feel your emotions and let them move through you. Remember to stay active and social Cancer Moon to keep your fire ignited, too much water can make you feel like a heavy wet blanket! Moon charting: Track the days you exercise so you can find your active windows and keep your fire ignited! A cleaning routine will keep you grounded and help you create and maintain your sanctuary. Color suggestions: Choose oranges to raise your energy, and choose other colors intuitively that match your mood. You are a charmer, Leo Moon! Always the life of the party, Leo Moons love to shine and want people to bask and enjoy the warmth their light creates. As a Leo Moon, you love to feel needed and want to further a cause you are passionate about. Though some people may see it as selfish, you put your needs and priorities first, and there is no shame in that! People can learn a lot from you! And since you glow like the full moon, you can be a very inspirational leader because people are magnetically drawn to you. Do not let this get to your head, Leo. The downfall for a lot of Leo Moon's is that they let their ego lead rather than their spirit. This can lead to abuse of power or manipulation. As long as you stay true and faithful to your cause, the Hero within you can rise and you will light the way for others after you. Moon Chart: Track the days you feel inspired and creative and the days you don't feel so connected. Stay connected to your spirituality so you can stay humble and centered in your values. Colors: Use tones or yellow and gold to keep your light shining. Royal purple for spirituality. If you find yourself frequently getting lost in a forest and have frequent encounters with faeries, then you are probably a Virgo Moon. You are drawn to nature and commune with Mother Earth and Her animals and almost prefer their company more than other human's. You may feel like an outsider, and some may feel you are unapproachable or aloof, but once someone knows you, you let them in to your wild untamed forests within and they can't help but feel like they have found a chest after a wild treasure hunt. You captivate them. Virgo Moons need room to grow and stretch, and you prefer tidy surroundings to do so as well. When Virgo Moons have the structure they need, it brings absolute freedom. With this freedom your roots will grow deep and strong. It can be hard for you to let go or people and things because you take a lot of time and effort to nurture your surroundings, like a beautiful wild garden. As a Virgo Moon, you need the wilderness and open skies to feel rejuvenated or you will get too stuffy and bitter. Moon Charting: Make getting out into nature a priority! Learn the local herbs and flora and forage to make a healing brew! Try a vegan or plant based diet this month and see how you feel. Track when you feel the most grounded and when you feel too restricted. Colors: Browns and greens bring out your earthy vibes and connect you to nature. Libra Moon signs tend to put everyone first before themselves. Though your sign is all about balance, you like to make sure others feel balanced rather than yourself! Libra Moons make the best counselors and therapists because they are so intuitively connected to others' needs and emotions. However this can leave little to no room for balance in their own lives! You need to make sure you are very clear with your needs and desires are and make sure you tend to them daily. Scheduling in 'me time' is essential for your well being. The more balanced you are, the more you can be there to serve and help others, which is a passion of yours. It's a win win! You are ruled by Venus too, so keep your surroundings peaceful and beautiful to you. This will keep you relaxed and rejuvenate you. Moon Charting: Track when you feel most balanced in fulfilled and when you neglected your own needs. Colors to use: Use pinks for self love, and any colors that are soothing to you. You are one of the most intense Moon Signs if you are a Scorpio Moon. As a Scorpion you are the masters of emotions and need an intense emotional connection to everyone you meet. You can scare people with this intensity, but also you intrigue them and they want to learn more. You like to keep people guessing and the mystery is palpable with you. Be aware, Scorpio Moon, of how your actions and emotions control others. Yes, I said control, because you love to toy with others emotions and think of it as a game. But karma usually keeps you in check. If you feel you are out of control, jealousy and possessiveness can take over. You need to feel that deep, soulful, connection, so one-on-one convos are best when connecting with others, and your spiritual life will be a big passion and focus for you. Moon Charting: It would be a great idea for you to track all the emotions you feel in a moon cycle and see what you feel the most! Choose the colors for your emotions intuitively! When you meet a Sagittarius Moon, you feel like you are being reunited with an old friend! 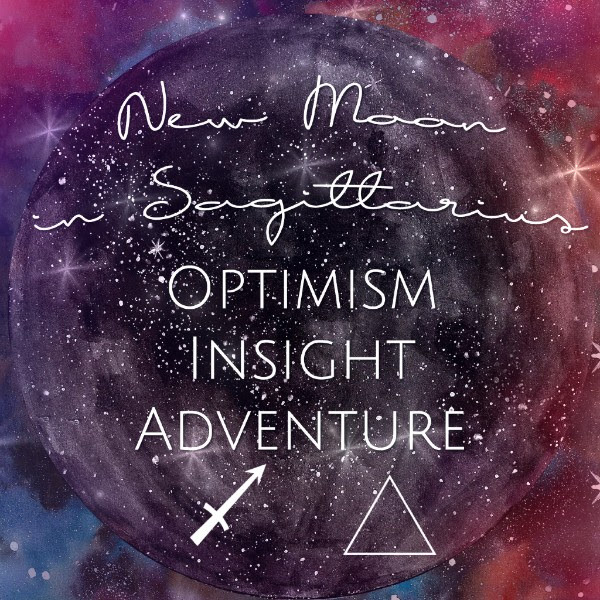 You are a optimist at heart, Sagittarius Moon and you love to be the friend who knows how to give a good pep talk. You are carefree and see the best in people and situations. You are great with children, because you are not afraid to be playful or childlike. You also love to flirt! It may be hard for you to commit to a relationship because when things get too serious, that's when you like to back away. You do love companionship though, so don't be afraid to open your heart to love! Think of it as a new adventure you can embark on! When you do settle down, you are loyal, warm and generous with your love. Moon Charting: Track when you feel the most optimistic and pessimistic in your moon cycle. You can also track when you prefer to be more social and outgoing and when you need to space. Color suggestions: Use bring colors like yellows, reds, and greens! If you are a Capricorn Moon, you know what it is like to be disciplined and know the meaning of hard work. You are deeply connected to your family and show your love through your actions. You show your love by providing and taking care of your loved ones. If you feel like you cannot provide, you can feel unworthy. Don't be so hard on yourself Capricorn Moon! You work so hard, you deserve to be proud of your accomplishments! There is nothing wrong with asking for help once in a while, or letting your emotions show through. You can be so inspiring, but also intimidating. Showing your soft side once in a while can deepen you connections and you may actually like it! Capricorn Moons need to feel they are needed and are driven by their love for their family. You are the rock and the reliable one. Moon Charting: Track when you feel the most driven and motivated and when you feel the most sluggish. Also track when you feel you can express your emotions easily and when they feel restricted. Colors: Use brown tones and greens! Aquarius Moons need the most freedom of all the Moon signs. You need your space to experience new ways of being and thinking. The company you choose loves how care free you can be and you bring out the best in people! You have a knack for understanding how others' minds work. Because of this, you also know you can bring out the worst in people and which buttons to press, especially your close relations. However, it is always a reflection of whats going on in your mind. You are an Air sign, so you like to stay in control of your emotions, but when it gets to be too much to bear, the Water Bearer spills the cup and your emotions runneth over. You need to learn to surrender to your emotions and let them move through you, your head will feel more clear after! Don't be afraid of your own emotions! You also need to keep your brain active and challenged, so make sure your hobbies are fun and challenge you to be a better person. Moon Charting: Track when you feel your ego taking over, or your spirit takes over. You can also track when you feel very inspired and motivated, and when you begin to feel apathetic. Colors to use: Bright blues for creativity and expression and gray tones for when you feel clouded or subdued. Dear Pisces Moon you are the Moon in her most sensitive sign. You feel it all and soak in everyone else's emotions like a sponge. Empathy is a powerful gift and can open very clear, channeled, psychic visions and pathways. You feel where the energy is going before most people understand what they are actually feeling, but it is easy for the Pisces Moon to feel overwhelmed and paralyzed from all this energy and stimulation. It is so important Pisces, for you to set healthy boundaries and cleanse your energy daily. You actually may have a hard time deciphering your own emotions because you carry so many from others. The more you ground and cleanse the more you will tune in to your true emotions. Because you empathy is so strong, you need to make time and create space you can drift off into. You are a fish and you need space to swim deeply and away from others; times of solitude are very rejuvenating for your spirit. Moon Charting: Track when you feel most empathetic and intuitive, and when you feel the most pessimistic or overwhelmed. Focusing on grounding and cleansing is important daily. Colors to use: Black for grounding and protection, orange to keep your energy up, purple tones for intuition. Now it is time to Tune to the Moon and let the moon be your guide. We created free printable Zodiac Moondala Compasses so you can learn to track your inner moon tides! Download your Moon Sign Chart! To begin, figure out your moon sign (you must know your time of birth) and choose the moon compass with your Moon Sign Zodiac Moondala. Fill out the dates for this current moon cycle starting on the New Moon. We kept them blank so you could use these for any future moon cycles! And don't worry Southern Hemisphere babes, there are charts for you too! Start on the New Moon and clarify your intentions for the cycle. Each Moon sign has a different energy to track (read about your Moon Sign to learn what to track). 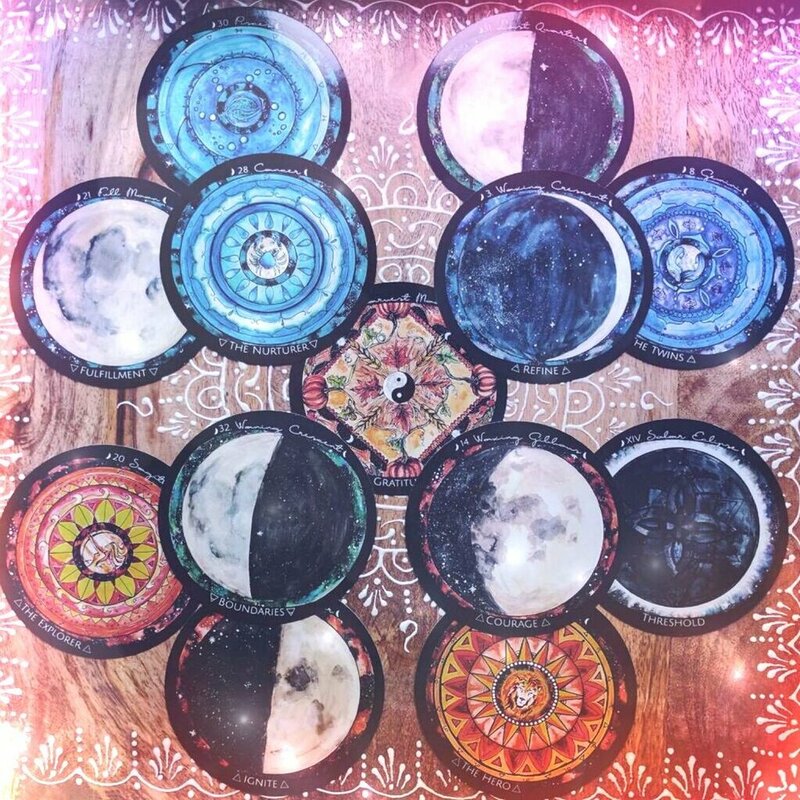 Now choose the colors you will use to fill in each moon slice that compliment your intentions and moon sign. I always recommend two colors to begin with and to keep it simple if you are new to moon charting. For example, if I wish to track my physical energy I could choose orange for when I feel energetic, productive and vibrant, and blue for when I feel tired, lethargic, or lazy. Or if I am tracking my intuition, I could use purple when I feel intuitive and connected and the color gray for when I feel disconnected or cloudy. Or if I am tracking a general feel of my energy, I would choose a color intuitively each time. The choice is up to you and there is no wrong way to do this! DO NOT overthink this step, just have fun with it and let your intuition and creativity guide you! Once you choose your colors, begin tracking daily! This means checking in with yourself daily throughout the moon cycle. The best time to do this is before you go to bed, or in the evening when your day is winding down. If weather permits, and even if it is only for 5 minutes, step outside into the night and connect with the moon (even if she is not visible). Ground yourself, connect to your intuition, and reflect on your day from that space. Check in with your intentions and what you are tracking, and then afterwards, color in your moon slice accordingly. There is room around the moon compass to write any keywords or emotions that felt potent to you. If you do this daily and commit to checking in with yourself, by the end of the moon cycle you will have a moon map that is a unique energetic flow of you! The more you fill these out, you may begin to see patterns and your connection to your intuition, your Moon sign, and Lady Luna will deepen! If you want to do a reading for this potent New Moon make sure to try one of the reading in the Spirit de la Lune Guidebook! We suggest the Solar Eclipse or Seed Moon reading, or both! 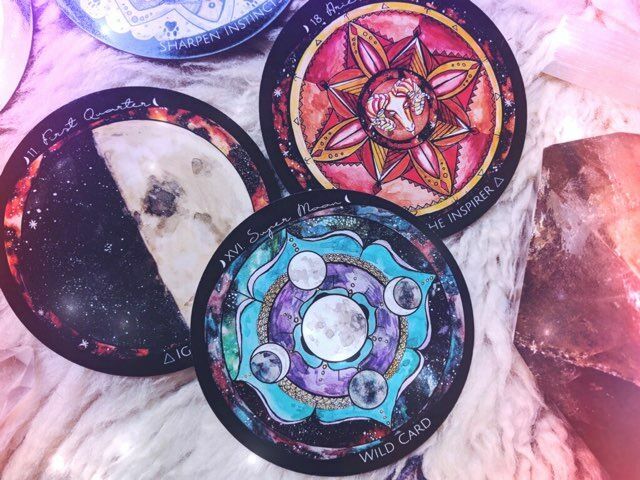 Create some moon water, charge your crystals and decks under the Solar Eclipse on Sunday! We would love to see your charts filled out with colors throughout the cycle! Take a picture and use the hashtag #tunetothemoon and tag @spiritdelalune in your photos! We want to see your faces, Moon Tribe! Take a picture with your Moon Sign card from Spirit de la Lune and tag #moonsignselfie! Tell us something that you learned about your moon sign or something you really love about yourself! We may feature you in a future blog post! Our decks are still in the production process, but they should be ready and available very soon! Be the first to know by signing up for our newsletter below! Join the Spirit de la Lune Moon Tribe!